A lot of people tend to buy receivers in terms of brand and price. However, some other aspects are crucial for getting a great device and saving money. First, the number of channels is meaningful for further upgrades. Note that 1 channel serves 1 speaker. If you are not going to set advanced home theater entertainments, 2 channels will do their job. By the way, you can read more about the best 2-channel stereo receiver to make a choice you won’t be sorry about. Then the number of inputs and outputs is important if you want to connect the additional devices. However, the first thing we need is a clear sound without distortions. 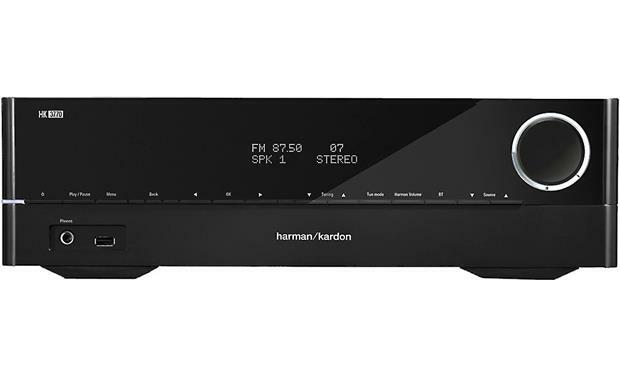 Some manufacturers managed to release the affordable stereo receivers that meet all of the above criteria. This device is equipped with discreet amps that have separate components to deliver detailed sound. It is also pure with minimum distortions due to the Sony STRDH190 transformer’s large capacity. Its 4 RCA inputs are enough to connect not only TV but other sources. If you want to watch movies at high volume, you can connect 2 sets of fronts speakers. Besides, to use them either in the same or in the different areas is possible. The Bass control function helps get well-balanced sound without the external subs. This stereo receiver can be easily connected to a TV via Bluetooth. Otherwise, you should use optical cable and converter to connect to RCA. Besides, this device does not have any HDMI hook-ups, so, the connection via patch cords is the only option. Sony STRDH190 can also be connected to a TV via a media device plugged into to the unit that has video pass through such as Blu-ray or DVD players. Note that you can pair Bluetooth to 1 device at a time but not both – a computer or iPhone, for example. The model has got digital audio inputs for TV and BD/DVD player connection. It makes possible to enhance LFEs in movie soundtracks due to the accurate tone calibration. Despite the lack of such advanced decoders as Dolby Atmos or DTS:X, the sound is rich and warm, and bass can be adjusted to sound balanced. The highs are clear and have no tinny sound. However, the power is not enough for a large room, but the unit performs great in middle-area dwellings. Regarding the picture, it is bright and clear, dark scenes are black enough. The optical input is intended for connecting TV. The receiver has analog RCA stereo inputs that can be connected with a TV’s headphone output or digital audio out (coax or optical). The TV should be set to output in PCM. If it is not so, you need to get one that will accept a 5.1 input. 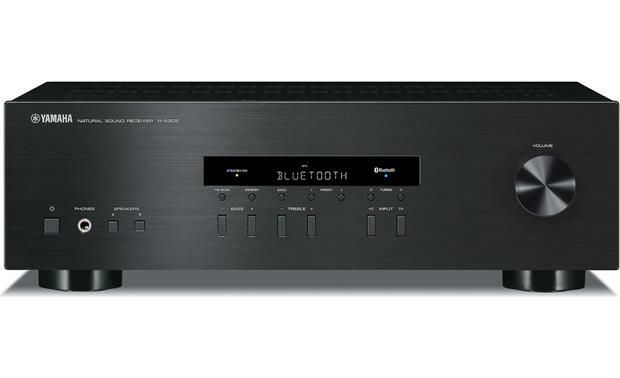 Onkyo TX-8220 has the option to by-pass the bass and treble controls to play without any adjustments for sound purity. Built-in Bluetooth allows streaming from the mobile device to the house speakers easily. The device provides a comprehensive, spacious, and relaxed sound due to its brand Harman Kardon’s GreenEdge tech. Its performance with the movie is great making it a rational alternative to a soundbar. The unit has a great audio component for a TV that delivers loud and clear sound, especially together with 2 hooked up speakers. Digital inputs permit to enhance not only the sound of common TVs s but also of streaming media players like Apple TV, too. It is possible to connect the HD TV to one of the 2 optical inputs and Blu-ray player to the digital coax input. This unit converts a digital signal to analog but only if that signal is PCM (stereo). Certainly, it can’t decode DTS or Dolby Digital like other low-cost stereo receivers. 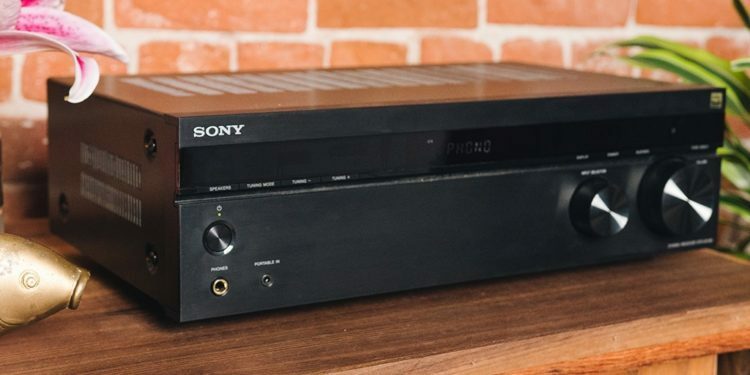 There are plenty of inputs for Phono, Tape, and DVD, 2 optical inputs, a network cable input, and a USB input on the front of the receiver to connect an MP3 player. Its a budget stereo receiver with Bluetooth connection. The device can reproduce the full range of musical tones and shades. Besides, the sound has very good bass to let you do without a sub. The Natural Sound saves the sound authenticity without distortions. The unit’s power transformer is situated next to the power amp that helps avoid power loss while increasing power capacity at highs. This model features 4 stereo RCA inputs, a stereo RCA output for recording to an external device like a CD recorder, and a 1/4″ headphone output. It makes it possible to connect 2 pairs of speakers but not wirelessly. A/B separation lets either one or both pairs be active. The TV won’t be connected without optical audio output to get audio from the TV to the amp that has speakers connected to it. In this case, you can make a connection with the aid of optical analog converter. If there is a headphone jack in a TV, you can use it to connect a TV to the amp. Besides, the TV should have an output for PCM stereo or a DAC that accepts 5.1 input. Like other models listed above, Yamaha R-S202BL has Bluetooth connectivity. This entry-level Hi-Fi system lacks bass management. A high-quality sound is provided with its design (it power transformer is right near the amp circuit like Yamaha R-S202’s one) to shorten the length of signal routes while optimizing the unit’s circuit layout. It has a signal ground and its power supply ground is connected at a single point that permits to get rid of interferences. Yamaha R-S202BL’s functionality makes it possible to switch off and on each channel independently.